Eastern Finland is very sparsely populated, and much of its landscape covered with lakes. Finland's largest lake, Saimaa, is here. Formed by an ice sheet that melted after the last Ice Age, Lake Saimaa is Europe's fourth largest lake and the only place in the world where you can find the endangered Saimaa ringed seal. Eastern Finland's provincial capital, Mikkeli, is on the lake's shores, making it a very popular holiday destination. Winters in Eastern Finland are rather cold and harsh. This is the snowiest province, after Lapland. Eastern Finland is divided into three regions: North Karelia, Northern Savonia, and Southern Savonia. North Karelia, which is home to three National Parks, is a great region for hiking and outdoor activities. About 70% of the region is made up of water, including lovely lakes and rivers for boating and canoeing. The biggest city in Eastern Finland is Kuopio, in Northern Savonia. It is a lovely city surrounded by the Kallavesi Lake, a large lake where trout and salmon abound. 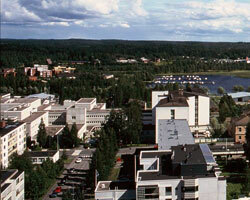 Kuopio is a renowned university town and also a notable cultural hub. It has a very modern urban centre that houses a number of technology companies. The countryside about Kuopio features wooden cottages and manor-houses set amidst attractive woodlands. Named after the archangel Michael (and so called St. Michel in Swedish), the municipality of Mikkeli on the shores of Lake Saimaa is only two hours' drive from Helsinki. Once a military centre during World War II, it is now a lively college town the city's largest employer is the Mikkeli University of Applied Sciences, which has a 4,500-strong student population and a sprawling campus with modern buildings set amid neat, green grounds and fields and forests. Most recreational activities in Mikkeli revolve around nature and the outdoors: hiking, skiing, fishing, canoeing, and swimming. But while its setting is rural, Mikkeli's attractions are more in keeping with those of a cosmopolitan city: a shopping district that includes wineries, textile stores and flea markets, and museums and cultural centers that hold concerts and art shows. The municipality is home to Ballet Mikkeli and hosts the annual Mikkeli Music Festival, a showcase of classical favorites. Another popular event is the St. Michel Weekend, an international harness race held on the Mikkeli racetrack. Mikkeli is the administrative capital of the region of South Savonia.